This is a very intriguing story and really pulls you in with interesting characters and a unique story world that is portrayed realistically. It makes you think about what could possibly be going on that we do not know about in our own world. Sam is the main character and she is almost 18, which is important to note as this means she will be free of her “job.” She works for an agency that houses and employs kids with paranormal abilities. She and the other kids there refer to it as “Rent a Kid.” All of the paranormal kids live on campus together, go to school and go on assignments in which they use their powers that are required, usually for spy work. Sam has the ability to read minds, which is very useful for assignments. This world reminds me of the television show, Dollhouse, which although short lived, was a great show about young people whose memories were wiped and who were given new identities for assignments in which they were rented out to people. They were given abilities that they would need for the tasks required. 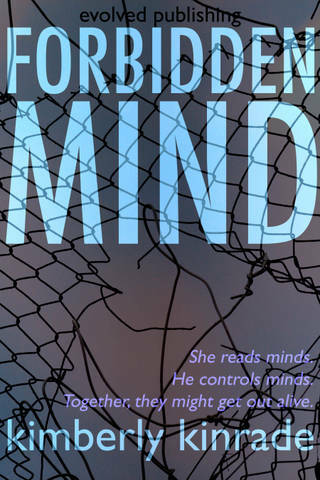 Forbidden Minds has that same pull with independent characters that fight back against this world that tries to take advantage of them and their abilities. Sam sees a boy brought into the clinic that she has never seen before and who calls for help. She hears his plea for help in her mind, that is. She tries to ignore it, knowing the rules of not getting involved. She is so close to being free of this place that she does not want to start to break the rules now, as she has been waiting so long to be able to have control of her own life. But when she hears him again, she finds out more. This boy, Drake, was kidnapped and is being held there, unable to use his power. He has the ability to convince people to do things based on planting thoughts in their heads, so they think it was their idea. this and determines to find out the truth. She tries to learn the truth by reading the staff’s minds, but finds that they have anticipated this. Then she learns that they have taken Drake somewhere else and everything starts to change for her. With some searching and help from her friends, she learns a whole lot fast. But when she gets sick, her departure for freedom gets delayed. She is taken to another location “to get better” and learns that this is the same place Drake is. This begins the start of finding out what is really going on behind the scenes and what plans they really have for her and Drake. The whole story is fast paced and I enjoyed reading it. The only part that I did not like as much was the ending, I felt it was not as strong as it could have been. It could have been better if the characters were more realistic with each other at the very end. But overall, it is a great story and is worth the read. I would love to hear more about these characters and I am glad I will be able to find out what happens next in their exciting and dangerous world, as there will be more to come! Click below to read a sample or purchase on Amazon.